Original gelcoat to hull and topsides, quality stainless fittings, a very original Freeman 23. 4 berths is 2 cabins, separated by bi-fold door. Skin fittings in place for Sea toilet if required. A delightful Freeman 23, presented in good order throughout. The present owners have kept her in superb order she is truly a lovely boat. She has a brand new Broads licence valid until 31.3.2020 and a current boat safety certificate which expires in November 2019. She has a custom made tonneau cover and a full winter cover both of which are included in the sale. She has a stainless steel pushpit for ease of boarding when stern on and a stainless grab rail just inside the cockpit behind the helm seat. Last out of the water 2017 for pressure wash and new anti foul, polics and rubbing strakes re varnished. 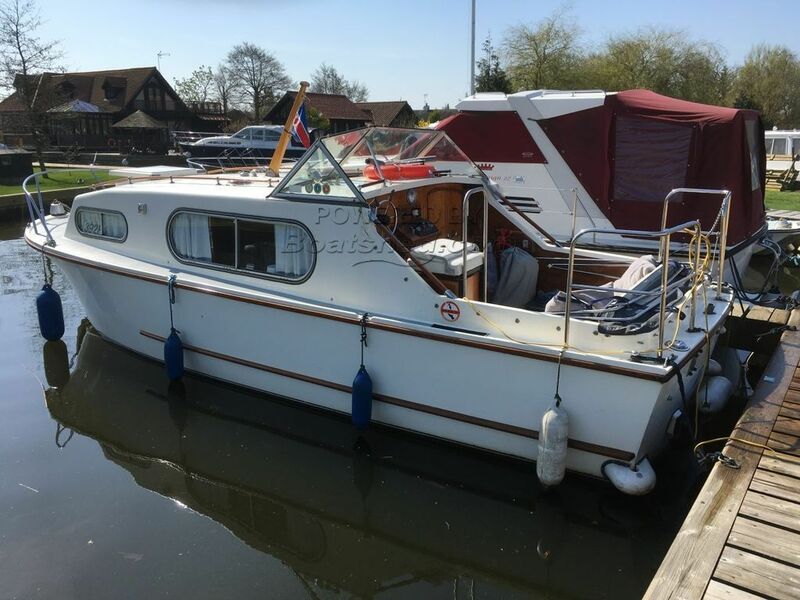 This Freeman 23 has been personally photographed and viewed by Kathy of Boatshed Norfolk. Click here for contact details.